Tubular reactors filled with static mixing elements are often used as plug flow reactors for both high and low viscosity chemical reaction systems. Figure #1: Typical layout of a skid-mounted small diameter long residence time static mixer plug flow reactor. Figure #2: GX static mixer used in plug flow reactors for viscous materials. In the production of both low & high viscosity organic and inorganic chemicals, a simple jacketed stirred tank with supporting auxiliary equipment is the traditional means of completing chemical reactions. In many cases and for various reasons, a batch tank reaction system may be best for a particular chemical synthesis and operating plant environment and should continue to be used. It is sometimes desired to operate continuously in order to eliminate batch-to-batch variations, produce a consistent product at all times and to have a compact dedicated continuous reactor to free up use of existing batch tank equipment. There are many equipment types and arrangements used to achieve continuous operations such as with the use of empty pipe reactors, cascades of stirred tanks, extruders, scraped surface reactors, etc. The typical process goals of a continuous reactor system are that the reaction product be homogeneous with regard to degree of reaction achieved, molecular weight, molecular weight distribution, viscosity, temperature and other operating conditions and chemical/physical properties. For this to be achieved, all the material within the reactor must be well mixed and have the same residence time (plug flow). In fast chemical reaction systems such as when a + b > c with no side reactions possible, simple empty pipe reactors are often used. 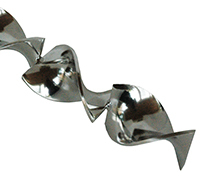 When fluid viscosities are water like, empty pipe reactors operating in deep turbulent flow most often work well. 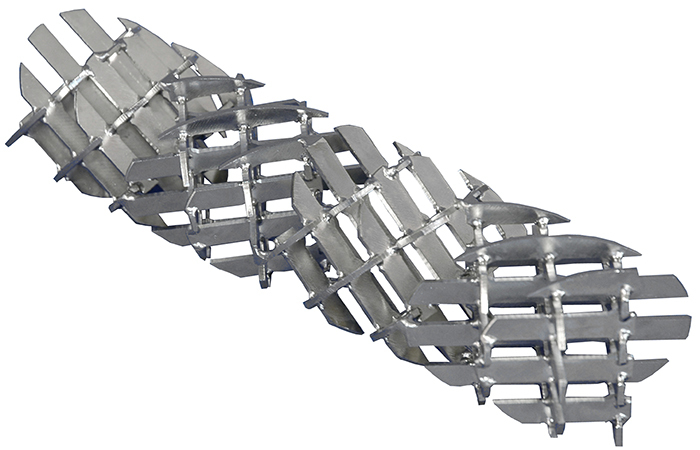 With increasing viscosity resulting in laminar flow operating conditions in the pipe reactor, static mixing elements will require to be installed in the pipe to assure good mixing of the reacting materials. In slow chemical reaction systems, long residence times are required to complete the reaction. These chemical reaction systems may be low or high viscosity throughout their entire reaction life cycle or viscosity may increase/decrease at various stages of the reaction. In addition, secondary reactants may require to be added after initial reaction and heat may be required to be added or removed. Because slow chemical reaction systems normally require long residence times, tubular reactors will operate in deep laminar flow regardless of fluid viscosity. 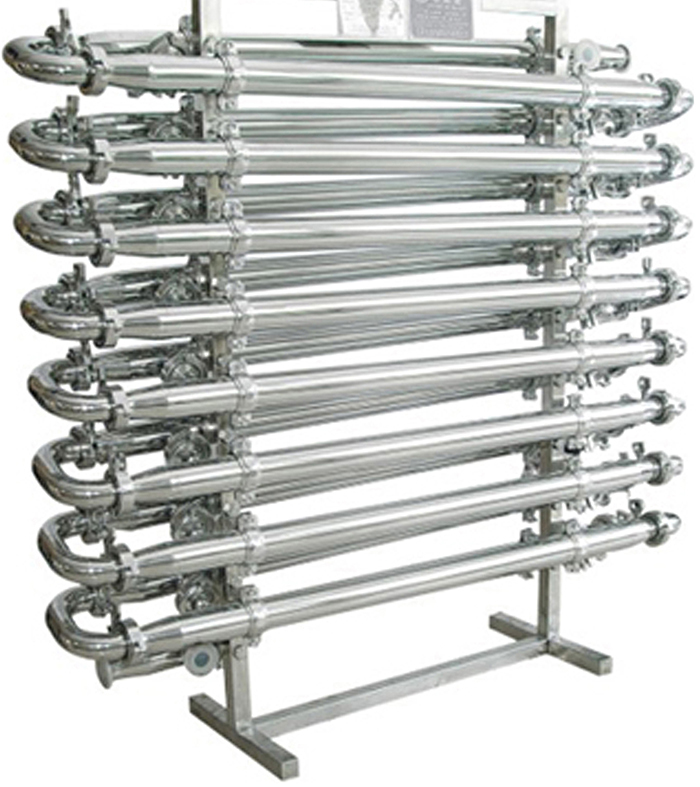 The tubular reactors are typically skid mounted in a sloped horizontal back-and-forth configuration (Figure #1) or in a vertical up-flow followed by a vertical down-flow configuration. The pipe/tubing is normally filled with static mixing elements such as shown in Figure #2, #3 and #4 where the choice of static mixing element insert is highly dependent on the chemistry of the reaction, diameter of unit, operating Reynolds number and Bodenstein number, fluid viscosity, heating/cooling requirements, etc. A tubular reactor is a fundamentally simple continuous reactor where there are no moving parts other than pumps that deliver the reactants. In a typical slow chemical reaction system where long residence times are required, the fluids passing through a tubular reactor are in the laminar flow regime even when the materials are low viscosity water-like fluids. An empty tube is unfortunately not suitable as a chemical tubular reactor in slow chemical reaction systems when the material processed is in the laminar flow regime. 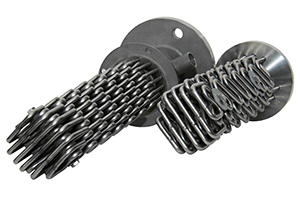 The addition of static mixing elements inside the tubular reactor creates the ideal conditions of radial mixing and near plug flow conditions necessary to perform chemical reactions in the laminar flow regime. 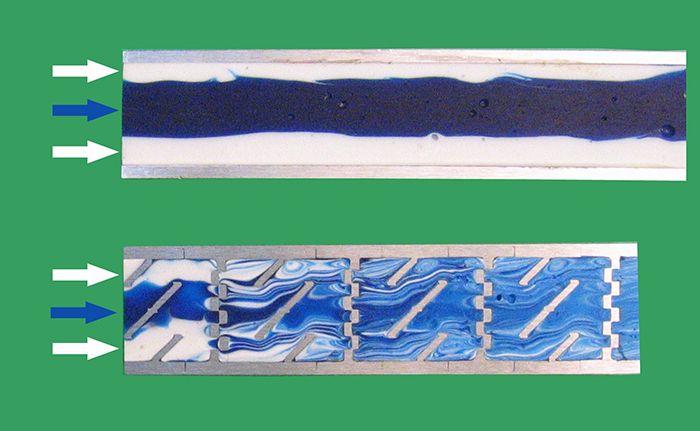 Figure #5: Laminar flow in an empty tube (top) and through a High Performance GX static mixer (bottom). In an empty tube, viscous material in laminar flow will exhibit no radial mixing (Figure #5 top) where material will exit the pipe in virtually the same position as where it was introduced into the pipe. 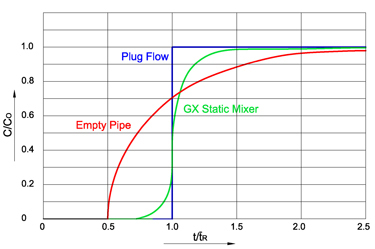 Addition of GX mixing elements in the same tube will create a high degree of radial mixing (Figure #5 bottom). In addition to excellent radial mixing, continuous reactors require plug flow conditions. Plug flow conditions means that all the material processed through the reactor must have the same residence time so that the chemicals exiting the reactor have witnessed the same reaction conditions of reactive species contact-time aging-temperature history. As shown in Figure #6, an empty pipe operating in the laminar flow regime (red curve) is a poor continuous reactor because the material in the center of the pipe travels at approximately twice the average velocity while material at the wall travels very-very slowly (dead-zone aged material). This results in poor plug flow characteristics as shown in the Step-Response experiment of Figure #7 when processing high viscosity material in laminar flow with little diffusion. Figure #7 shows that in an empty pipe (red curve), the viscous material in the center of the pipe will exit only partially reacted (short residence time) where the first material break-through is at ~0.5 of the overall residence time while viscous material at the wall will take a very-very long time to exit the pipe with residence times of ~100+ due to the slow removal of aged wall material that is creeping on the wall. The addition of High Performance GX static mixing elements in the same pipe processing viscous materials dramatically improves plug flow characteristics (Figure #6 and #7-Green Line) where the bulk of the material exits the pipe in 2.5 residence times. 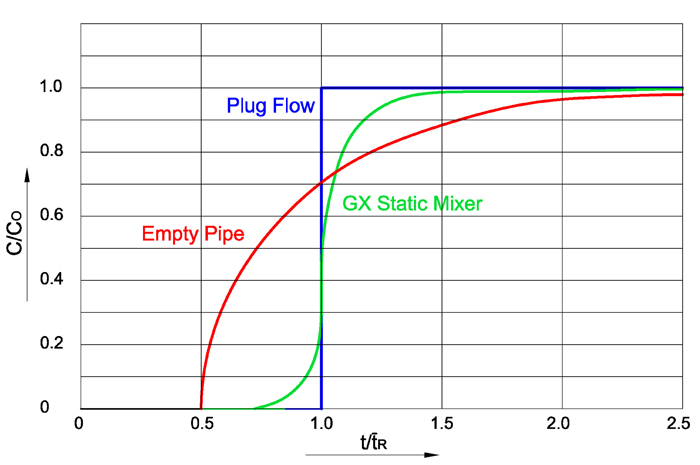 The blue curve shows ideal plug flow. 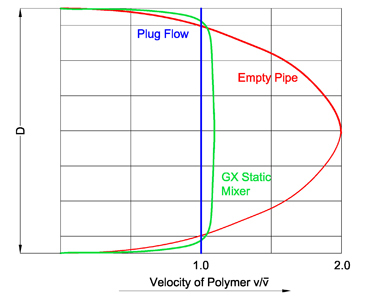 In low viscosity chemical reaction systems, the velocity profile of Figure #6 continues to exist which necessitates the use of static mixer inserts to achieve good plug flow characteristics. However, a low viscosity environment allows for diffusion of the reacting species where in high viscosity systems diffusion between species is very low to non-existent. This means that in low viscosity chemical reaction systems, plug flow characteristics improve because diffusion occurs between the bulk fluid and wall material and is not exclusively dependent on radial mixing created by the static mixing elements. This diffusion phenomenon occurring with low viscosity chemical reaction systems allows for the use of Medium Performance Type HT Helical static mixers which are less costly and consume lower pressure drop than the High Performance GX static mixers which is the only design suitable for high viscosity plug flow reactors where diffusion of chemical species is very low. 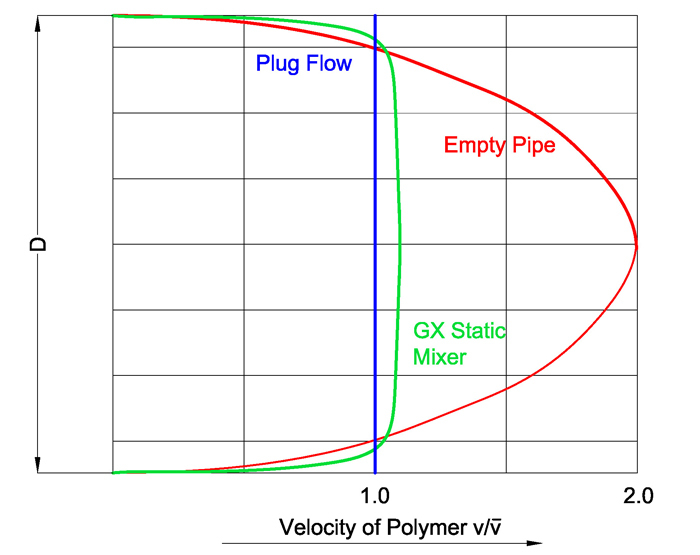 Figure #7: Step Response Curve for Ideal Plug Flow (blue), High Performance GX static mixer (green) and Empty Pipe (red) in a high viscosity system with low-to-no diffusion of the chemical species..